EXECUTIVE SUMMARY: North Korea’s nuclearization has implications for Israel’s nuclear deterrence posture. There are several plausible means by which a nuclear conflict could arise in the Middle East. It may be time to consider a phase-out of Israel’s “deliberate nuclear ambiguity” and to focus Israeli planning around evaluations of enemy rationality. In the end, we still depend upon creatures of our own making. For the moment, at least, global concern about nuclear war is focused on North Korea. 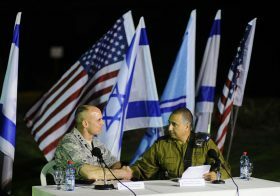 The Middle East nevertheless remains a possible site for future nuclear conflict, and Israel’s strategy for dealing with this prospect warrants close examination. Worth pointing out, too, is that these two seemingly discrete theaters of potential nuclear belligerency are not mutually exclusive. Quite the contrary. Nuclear warfare events in these two distant places could become mutually reinforcing. Any conceivable resort to nuclear weapons on the Korean peninsula would almost certainly affect nuclear incentives elsewhere. At a minimum, any breaking of the longstanding nuclear taboo in Asia (southwest as well as northeast Asia, if coup-vulnerable Pakistan is factored in) could enhance the presumed usability of nuclear weapons in the Middle East. There are overarching questions to be asked. How, precisely, might Israel find itself in some form or other of a nuclear war? Under what circumstances might it use nuclear weapons? For the moment, at least, any such concerns might appear baseless. After all, Israel remains the only presumptive nuclear state in the region. But Tehran, like Pyongyang, will not desist from its nuclear ambitions. Iranian membership in the Nuclear Club is more than likely to occur within the next several years, the Vienna 2015 Iran Agreement notwithstanding. Moreover, even in the absence of a single regional nuclear adversary, the Jewish State could still find itself having to rely upon nuclear deterrence against certain biological and/or massive conventional threats. To answer its most basic nuclear questions, Jerusalem’s strategic planners will need to adhere closely to well-established canons of systematic inquiry, logical analysis, and dialectical reasoning. There are four plausible, intersecting narratives that “cover the bases” of Israel’s nuclear preparedness: 1) nuclear retaliation; 2) nuclear counter-retaliation; 3) nuclear preemption; and 4) the fighting of a nuclear war. Should an enemy state or alliance of enemy states ever launch a nuclear first strike against Israel, Jerusalem would respond, to whatever extent possible and cost-effective, with a retaliatory nuclear strike. If an enemy first strike were to involve some other form of unconventional weapon, such as high-lethality biological weapons of mass destruction, Israel might still launch a nuclear reprisal. This response would depend in large measure on Jerusalem’s calculated expectations of follow-on aggression, and also on its assessments of comparative damage limitation. 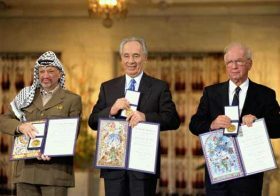 If Israel were to absorb “only” a massive conventional attack, a nuclear retaliation could not be ruled out, especially if: (a) the state aggressor(s) were perceived to hold nuclear and/or other unconventional weapons in reserve; and/or (b) Israel’s leaders were to believe that exclusively non-nuclear retaliations could not prevent annihilation of the Jewish State. 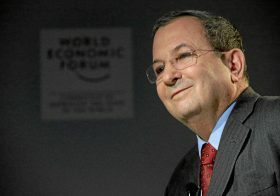 A nuclear retaliation by Israel could be ruled out entirely only in those circumstances in which enemy state aggressions were conventional, “typical” (that is, sub-existential, or consistent with previous historical instances of enemy attack in both degree and intent), and directed solely at hard targets (i.e., Israeli weapons and military infrastructures and not at “soft” civilian populations). 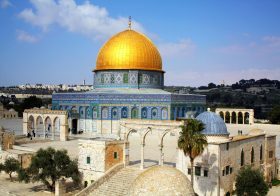 Should Israel feel compelled to preempt enemy state aggression with conventional weapons, the response of the target state(s) would largely determine Jerusalem’s next moves. If the response were in any way nuclear, Israel could plausibly turn to nuclear counter-retaliation. If the enemy retaliation were to involve other weapons of mass destruction, Israel might feel pressed to escalate. 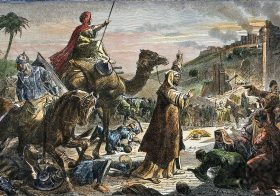 All pertinent decisions would depend upon Jerusalem’s early judgments of enemy intent, and on accompanying calculations of essential damage limitation. Should the enemy state’s response to Israel’s preemption be limited to hard-target conventional strikes, it is unlikely that the Jewish State would move on to nuclear counter-retaliation. If, however, the enemy’s conventional retaliation were “all-out” and directed against Israeli civilian populations, not just Israeli military targets, an Israeli nuclear counter-retaliation could not be excluded. It would appear, then, that such a counter-retaliation could be ruled out only if the enemy state’s conventional retaliation were proportionate to Israel’s preemption, confined exclusively to Israeli military targets, circumscribed by the legal limits of “military necessity” (a limit codified in the law of armed conflict), and accompanied by explicit and verifiable assurances of non-escalatory intent. It is exceedingly implausible that Israel would ever decide to launch a preemptive nuclear strike. Although circumstances could arise wherein such a strike would still be rational, it is unlikely that Israel would ever allow itself to reach such dire circumstances. 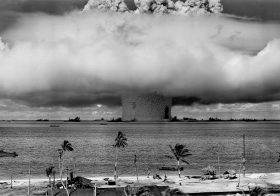 Unless the nuclear weapons involved were somehow used in a fashion consistent with the laws of war, this all-out form of preemption would represent an especially serious violation of international law. Even if such consistency were possible, the psychological/political impact on the world community would be fiercely negative and far-reaching. This means an Israeli nuclear preemption could be expected only when (a) Israel’s state enemies have acquired nuclear and/or other weapons of mass destruction judged capable of annihilating the Jewish State; (b) these enemies have made clear that their military intentions parallel their capabilities; (c) these enemies are believed ready to begin an active “countdown to launch;” and (d) Jerusalem believes Israeli non-nuclear preemptions cannot possibly achieve minimum levels of damage limitation – that is, levels consistent with physical preservation of the state and nation. Should nuclear weapons ever be introduced into an actual conflict between Israel and its enemies, either by the Jewish State or by an Arab/Islamic foe, the fighting of a nuclear war could ensue at one level or another. This would be true so long as: (a) enemy first strikes against Israel do not destroy Jerusalem’s second-strike nuclear capability; (b) enemy retaliations for an Israeli conventional preemption do not destroy Jerusalem’s nuclear counter-retaliatory capability; (c) Israeli preemptive strikes involving nuclear weapons do not destroy adversarial second-strike nuclear capabilities; and (d) Israeli retaliation for enemy conventional first strikes does not destroy enemy nuclear counter-retaliatory capability. It follows that in order to satisfy its most essential survival requirements, Israel must take immediate and reliable steps to ensure the likelihood of (a) and (b) and the unlikelihood of (c) and (d). In all cases, Israel’s nuclear strategy and forces must remain fully oriented towards deterrence and never towards the actual fighting of a war. With this in mind, Jerusalem has likely already taken steps to reject tactical or (relatively) low-yield “battlefield” nuclear weapons and, as corollary, any corresponding plans for counter-force targeting. For Israel, nuclear weapons can make sense solely for deterrence ex ante, not for revenge ex post. These four core scenarios should remind Israel of the overriding need for coherent nuclear strategy and doctrine. Among other things, this need stipulates a counter-value targeted nuclear retaliatory force that is secure from enemy first strikes, and simultaneously capable of penetrating any enemy state’s active defenses. To best meet this imperative security expectation, the IDF would be well advised to continue with sea-basing designated portions of its nuclear deterrent force (that is, placing them on submarines). Naturally, to best satisfy the equally important requirements of penetration capability, Tel Aviv will have to stay well ahead of all enemy state air defense refinements. Sooner rather than later, Jerusalem will need to consider a partial end to its historical policy of “deliberate nuclear ambiguity.” By incrementally removing the “bomb” from the “basement,” Israel’s planners would be better able to enhance the credibility of their very small country’s nuclear deterrence posture. However counterintuitive, the mere possession of nuclear forces does not automatically bestow credible nuclear deterrence. Always, in strategic nuclear planning, reason must hold pride of place. Would-be aggressors, whether nuclear or non-nuclear, must be encouraged to believe that Israel has the willingness to launch measured nuclear forces in retaliation, and that these forces are invulnerable to first-strike attacks. Additionally, these enemies must be made to expect that Israel’s designated nuclear forces would penetrate their already deployed ballistic missile and related air defenses. It follows that Israel could benefit substantially from releasing certain broad outlines of relevant strategic information. Without a prior and well-fashioned strategic doctrine, no such release would make any sense. All such information could support the perceived utility and security of Israel’s nuclear retaliatory forces. Released solely to maximize Israeli nuclear deterrence, it would center purposefully upon the targeting, hardening, dispersion, multiplication, basing, and yield of selected ordnance. Under certain conditions, it must be understood, the credibility of Israeli nuclear deterrence could vary inversely with the perceived destructiveness of its relevant weapons. In the end, Israel, heeding Goethe, must depend upon policies and calculations of its own making. Accordingly, what is currently happening on the Korean peninsula could have serious implications for what eventually happens in the Middle East. One especially crucial and common focus in both theaters of potential nuclear conflict is the presumed rationality or irrationality of the adversarial state leaderships. The same questions that now surround Kim Jong un could soon pertain to Iran’s decision-making elite. Israel, like the US vis-à-vis North Korea, will need to prepare very differently for a rational nuclear adversary than for an irrational one. In such bewildering circumstances, Jerusalem decision-makers would need to distinguish between genuine enemy irrationality and pretended enemy irrationality. In actual practice, operationalizing such a subtle distinction will not be easy.